Having read that it had just recently opened, and confident that the salad that I had brought into work for lunch would not even come close to satisfying my hunger, I set off to Square 1 Burgers & Bar. It is a small Tampa-based chain, which I had been interested in sampling, so I was very pleased to find out they were expanding into my area. The restaurant's ambiance belied its food offerings a bit. It was a sit-down establishment, with a full bar, tablecloths, and cloth napkins. I arrived at the end of the lunch rush, and was seated immediately. Besides a full array of burger options, the menu offered a large selection of appetizers, sandwiches, milkshakes, and several alternatives for those who prefered to not eat meat. I ordered the All-American Burger, described as "100% Meyer’s Angus burger on a sesame seed bun with American cheese, curly leaf lettuce, beefsteak tomato, red onion and mayonnaise." It took approximately 20 minutes for my order to arrive. While this was somewhat perturbing, they did get a pass on this visit, as they had only been open a couple of days. The Beef: Square 1 sourced their beef from Meyer Farms, and described it as Natural Red Angus, acquired from free-range cattle that were fed natural grass and grain diets. The beef did live up to its extended billing. It was very flavorful with strong mineral notes and a healthy, beefy funk. It was 80/20 Chuck, and it was juicy, (mostly--more on that below) tender, and not at all greasy. The Seasoning: The patty was seasoned with a fair amount of salt and a small amount of pepper. It ended up being just right. Anything more would have overshadowed the beef. The Sear: The kitchen achieved a solid sear on the patty, though a little unbalanced (one half had heavy sear, while the other had a lesser sear). It added some interesting textures and flavors to an already good cheeseburger. The Preparation: The odd shape was a dead giveaway that the patties were hand-formed. The grind of the beef was OK, but I detected signs of too much manipulation in a small portion of the patty that left that part of it a bit too chewy. I ordered a Medium burger. It came out Medium-Well. I would have asked for a re-fire, but I had already waited 20 minutes for my meal, and I was hungry. Nonetheless, the cheeseburger at Square 1 remained juicy in spite of being overcooked. The Cheese: A thick slice of American cheese topped this burger, and its creamy flavor and texture provided a nice counterbalance to the powerful beef. 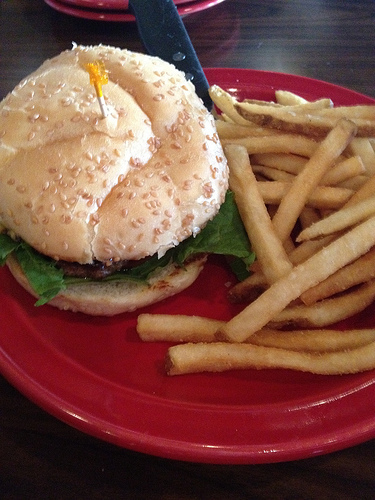 The Bun: My burger was served with a sesame seeded, Kaiser roll...source unknown. The insides were lightly buttered and grilled. It had an airy texture, but it was still firm enough to hold up to a half pound of meat and cheese. It tasted very fresh and a little yeasty. It was good, and it would have been as good without the buttering and grilling. 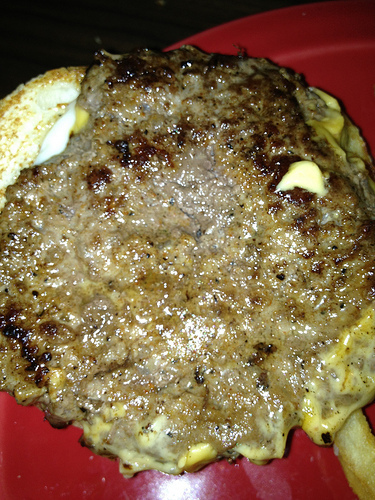 The Meat To Bun Ratio: The meat covered the bun, but did not extend beyond the edges. There was no chance of bread overtaking meat on this burger. The Fries: The fries were delicious. They were fresh-cut, hot, crisp, and sprinkled with very coarse sea salt. Side Note: When I saw a plate of onion rings being delivered to another table, I immediately kicked myself (ouch) for not sampling them. I will not make that mistake again on my next visit. The Toppings: As always, I removed the lettuce, tomato, and onion that were served atop the burger. However, let it be known that they were fresh and of high quality. The Romaine lettuce was a healthy shade of green, and completely unwilted despite the moisture from the burger it accompanied. The red onion was crisp and fresh. Finally, the tomato was beautiful: red, juicy, and with perfectly-textured flesh. It would have made for a great salad, if you're into that sort of thing. The Value: $8.50 for a cheeseburger and fries was pushing it. However, it was quality beef, and the portions were large, so I was not displeased when the bill arrived. 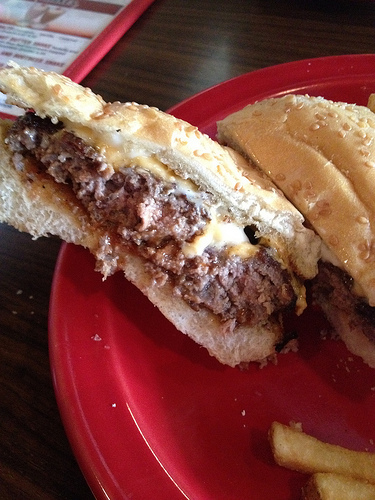 Burger Review: Square 1 used some top ingredients, which translated to a tasty product. They were teetering on the brink of excellence. Hopefully, they will work out some of the deficiencies that are common in a fledgling restaurant, which should push them over the line. Who the hell is Sean H? Where's Pete? Where's the flash, where's the funny? Sean H. AKA Ugly Bay Of Mostly Water is one of the gang. He contributes reviews as he travels the globe.